Organic chemistry is the largest topic on the syllabus and concerns the reactions and properties of compounds containing just one element - carbon. The first sub-topic has the heading "Fundamentals of organic chemistry" but in some ways it does not really cover why the chemistry of carbon, has a whole branch of chemistry all to itself. I think it is important that you not only know that there are more carbon compounds known than the total of all the compounds of all the other 100+ elements put together but why this is so. There are several different reasons for this. These include the ability of carbon to form chains and rings and also the relative strength of the C-H bond compared to the Si-H, Ge-H and Sn-H bonds and the relative strengths of the carbon to carbon bonds (C-C, C=C and CΞC) compared to the bonds formed between the other Group 14 elements. Unlike the other elements in Group 14 carbon does not have not readily available empty d orbitals and so cannot expand its octet. This explains why tetrachloromethane, CCl4 just forms two immiscible layers when mixed with water, whereas tetrachlorosilane, SiCl4 (silicon tetrachloride) react vigorously with water. You will need to memorise and identify different classes of organic compounds and functional groups but in fact organic chemistry is quite logical and mechanisms such as free radical substitution explain how reactions proceed and enable you to predict what may occur when other similar reactants are used. More mechanisms such as nucleophilic substitution, electrophilic addition and electrophilic substitution are included in the higher level material. To help you work your way through this topic I have split some of the sub-topics up into smaller pages. Try to understand each part as you work through it and test your self regularly so that you are able to separate out each concept otherwise there is a danger that it will all become mixed up. In fact organic chemistry provides a useful tool to reinforce many of the concepts that you have already met. Many organic reactions are in fact redox reactions as there is a change in the oxidation state of carbon during the course of the reaction. Higher Level students should recognise too that organic reaction mechanisms involving the use of curly arrows (which represent the movement of pairs of electrons ) are examples of 18.1 Lewis acids & bases. As you go through the topic, supplement the questions I have given on each page with the additional examples I have provided in Novel uses for the IB data booklet . These provide interesting molecules that contain different functional groups to complement the usual examples of carbon compounds containing up to six carbons atoms. This should help to increase your enjoyment as you will more easily see the relevance of the topic. It will most probably help you too when you come to study your chosen option. 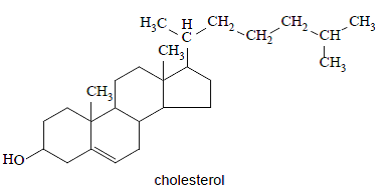 Is cholesterol a primary, secondary or tertiary alcohol?